We’d love your help. 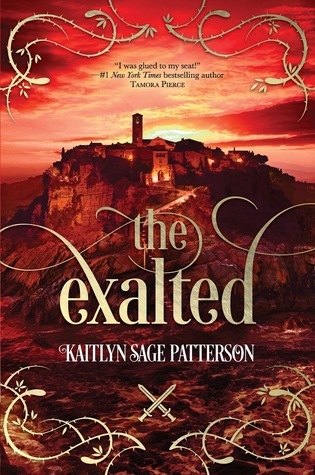 Let us know what’s wrong with this preview of The Exalted by Kaitlyn Sage Patterson. To ask other readers questions about The Exalted, please sign up. I was lucky enough to get an advance copy of this follow up to The Diminished. It's filled with the same lush details and gorgeous writing as The Diminished, and I loved the further character development of Curlin. The Exalted is faster paced than book one and moves swiftly back and forth between Vi and Bo. The twin relationship allows both male and female leads to be equally strong, regardless of their upbringings or desires to rule. Their connection makes it impossible for one to rise above th I was lucky enough to get an advance copy of this follow up to The Diminished. It's filled with the same lush details and gorgeous writing as The Diminished, and I loved the further character development of Curlin. The Exalted is faster paced than book one and moves swiftly back and forth between Vi and Bo. The twin relationship allows both male and female leads to be equally strong, regardless of their upbringings or desires to rule. Their connection makes it impossible for one to rise above the other. It's an interesting discussion on religion, government, and society—blind faith and corruption. I loved the ending and wish I could go on about it here but don't want to spoil it. Having read The Diminished first, I'm not sure how easily this would stand alone to new reader—I can't unlearn the first book, so I'm not a good judge of that, but since I loved The Diminished so much, I would advise a new reader to Patterson's work to start at the beginning. It's truly an epic journey. Kaitlyn Sage Patterson grew up with her nose in a book outside the Great Smoky Mountains National Park. After completing her M.F.A., she moved to South Korea, where she taught English and started writing her debut novel. THE DIMINISHED will be published by HarlequinTEEN in April 2018, followed by its sequel in 2019. When she's not staring off into space and trying to untangle some particularly tro Kaitlyn Sage Patterson grew up with her nose in a book outside the Great Smoky Mountains National Park. After completing her M.F.A., she moved to South Korea, where she taught English and started writing her debut novel. THE DIMINISHED will be published by HarlequinTEEN in April 2018, followed by its sequel in 2019.